It’s been a long hot summer this year and I know I’m not the only one ready for fall. Once again we’ve endured the heat of summer to get to the cooler, dryer air of autumn. We are quickly approaching a time of year when the bait rises from the cooler depths of the thermocline and I’m already seeing numerous pods of small threadfin scattered throughout the creek on the surface. It won’t be long now till the 1st and second year bluebacks follow suit along with the threadfin and seek the warm sun near the surface. Inherently, groups of bluebacks in Lake Lanier rise to the surface in October basking in the remaining warm surface water as the lake begins it’s winter cool-down and bass as well as stripers start feeding up for the winter gorging themselves on the surface offerings. Our summer stripers have been hanging around the deep waters of the main lake chasing massive schools of bluebacks but in the fall the stripers start making their way back into the creeks where the new batch of first year threadfin are piled up and waiting. The threadfin are just an addition to the menu for our stripers and bass and they provide some excellent topwater opportunities for us anglers. When I think back to October over the past few years, one thing that always comes to mind is our fall topwater bite. 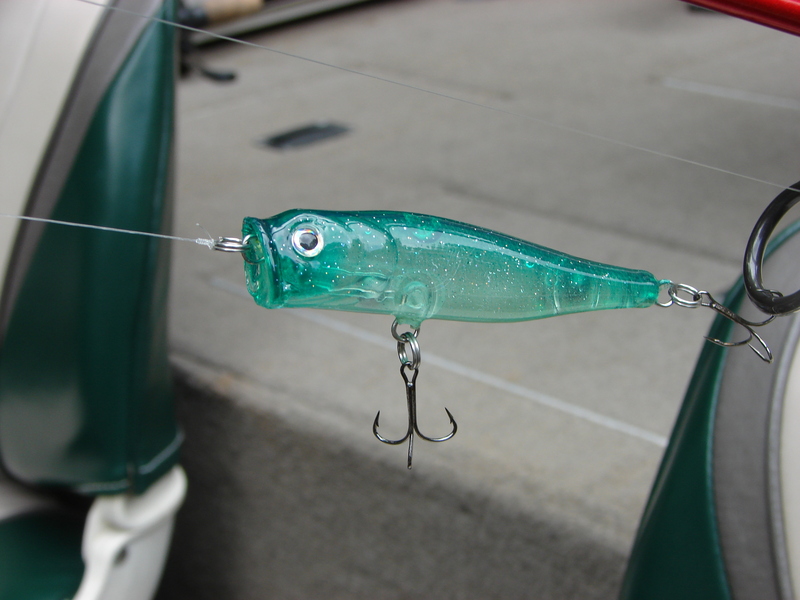 More specifically, for the past few years the stripers and bass have fallen prey to my Emerald Popper in the fall and the way things are shaping up, this fall should be no different. This fall I’m going to do something a little different and make an interesting offer to ya’ll. As some of you know I fished my first FLW Bulldog series tournament as a Pro earlier this year on Lake Lanier and I really enjoyed the tournament and the tournament atmosphere in the FLW. I’ve always been a competitor and the level of competition in the Bulldog trail was a challenge that I couldn’t resist. I managed to finish in the money in my first tournament as a Pro and I’ve set a goal for myself of fishing the full Bulldog series trail next year. With that being said, as you can guess it isn’t going to be a cheap endeavor. I need to offset some of the cost and I’m going to offer a few things to help with that. First off, as some of you know I have a military background and in the military one of the things we used to do was award challenge coins to our over achievers. It was always a big honor to be given a challenge coin and I’ve collected a few over the years. I’ve designed a Cast Away Baits challenge coin for my Emerald Popper topwater bait and it will come complete with a inset notched bottle opener with my old cast away fishermen under a palm on the front of the coin and the words “I popped the top with Cast Away Baits” inscribed on the back. I should be receiving 100 of the custom challenge coins in the near future and I’m going to offer these coins to anyone who wants to jump in my boat with me this fall and take a shot at catching a fish or two on the popper for a few hours of fishing plus you’ll get to keep your own popper. I’ll even throw in a Cast Away decal to sweeten the deal even more. That a total of learning to use the popper on a topwater fishing trip with me, a custom Cast Away “Popping the Top” challenge coin, one of my Emerald Poppers and a decal to commemorate the trip. *If you’re not local and would like to drop in for a weekend, be sure and ask about availability of our 3 bedroom private fish camp on Lake Lanier. I can offer a weekend getaway package that includes a day of fishing with me and if you bring your own boat, we have a single slip covered dock to park your boat for the weekend. I don’t consider myself a guide and we have some very knowledgeable, talented bass guides on Lanier so I’m not going to charge a guides fees for the trip but I do need to earn some money to offset the cost of the trail fees. I’d also like to invest in a wrap for my boat for the trail next year and represent some local businesses as well as some bigger tackle names in fishing. I will be spending the fall and early winter soliciting some sponsors in exchange for advertising on my wrap and on my videos so if you are interested in a trip out this fall or you have an interest in some sponsorship just drop me a line or give me a shout for more information. Keep an eye out here on my blog for a topwater start date and a picture of the Cast Away Challenge coin very soon. A few years back and ran across a topwater blank that I really liked so I bought a few and painted them in a few of my favorite colors. When the fish are surfacing in the spring and fall the hump buster is a great choice, mainly because of the size and shape of the bait. It is the same profile as a blueback swimming on the surface and this bait looks great when walking the dog. My wife Lisa’s biggest largemouth to date came from this bait and it’s quickly becoming a favorite of mine on Lanier. Here’s a video and a few pictures of the Hump Buster in action. When I looked at the schedule for the HD Marine Lake Lanier tournaments and the date for the FLW Bulldog series tournament on Lake Lanier I knew it was going to be a grind. This grind included the grind of telling my wife I was going to be busy fishing for 3 weekends straight and probably doing a lot of pre-fishing in between. Now what fisherman can pull that one off without winding up in the dog house?? Well, you know what they say; “behind every good fisherman is an understanding wife”. They do say that you know…. Thankfully, I have an understanding wife, or she just wants to get rid of me, one of the two…..
Just over a month ago a few of my retired buddies and I were hitting the creek and catching fish out in the ditches and along the edges where the water runs up shallow. It’s not my style of fishing but I suffered through the agony of jerkbaits, underspins and spoons while the fish made their winter home out in deep water. The whole time I was just biding my time till my shallow water bite came around. While hanging out in the shop on the bad weather days I was making crankbaits in preparation for warmer days and the upcoming tournaments. I knew that we would have some nice days and from past experience it wouldn’t be long till our winter started giving way to spring and the bass would start foraging on the rocks. Usually when the water temps reach the 50 degree range the crawfish get active and the bass start fueling up for the upcoming spawn. On the sunny days the bass will hit the rock piles to find just a bit more warmth and whatever food source they can scavenge. It’s not like they always stay on the rocks but they will stage in deeper water and run up and down the shallow rocks when it’s time to put the feed bag on. When this happens I like to hit the rocks with crankbaits and jigs. Here’s a picture of the cranks I made and a good one I caught right after making them. Just over 3 weeks ago we had a sunny day and I was starting to pre-fish my first tournament of the 3 week stretch. I decided to hit a few rocks with some custom DT10 knock-offs I made in a shad pattern. It’s a pattern that I’ve been making for a few years now and it’s a pattern that works really well on the rocks when the bass are foraging. To that point I had been zeroing on the rocks with the crankbaits but on that day the pattern came around and I caught some fat bass up on the shallow rocks on a sunny day. That gave me some hope and something to go on. This was on the south end of the lake but I pretty much knew it would be the same up north too. There are some good rock piles up on the north end of the lake and that made it more convenient than running all the way down south from a tournament that launched on the north end, which all 3 of the upcoming tournaments did. Prior to the tournaments the best pattern I found while pre-fishing was throwing the crankbaits and jigs up on the rocks so I made up my mind that’s what I was going to do. The day before the first HD tournament was a sunny day so I checked my rock piles up north and I was right, the fish were on the rocks and I caught a nice limit. That gave me confidence for tournament day. The only drawback was that on tournament day it was overcast. When we hit the first rock pile the morning of the tournament the fish had backed off the shallows and suspended in 15-20 feet of water which threw a monkey wrench in my well laid plan. That morning I was able to compensate and I caught a quick limit using my shad crankbait pattern and caught my fish slow cranking the medium diver through the suspended fish. Usually I’m working the bottom with the cranks but these suspended fish wanted it up in the column. Problem was, once I caught the limit, that was the last fish I caught for the day. We went on the hunt for bigger fish and came up empty. We strolled into the weigh-in with just short of 10lbs and there were a lot better fishermen than us out there on that day. Moving on to the FLW pre-fishing, my creek buddies were giving me some intel on a good pattern they had been using and that was using crawfish colored crankbaits. I knew I was going to have to bust double digits in the FLW tourney and it seemed that the crawfish pattern was yielding some bigger bass than my shad pattern. I made a few of my little DT-10 knock-offs in a crawfish pattern but as usual I started shopping at Tackle Warehouse. “Forget Holly Madison, if anyone ever hacks Tackle Warehouse I’m screwed”. After looking at pictures my retired creek buddies had sent me, I was looking for anything in a crawfish pattern that caught my eye and that’s when I found the Rapala DT-14 in Red Crawdad. It caught my eye and it was perfect so I ordered 5. The day before the FLW tournament my buddy and I took a little boat ride and threw a few of our crawfish baits up on the rocks and we caught a few nice ones. I felt good about my chances for the tournament and I kinda knew I was going to put some fish in the boat. The tournament launched out of Laurel Park and my plan was to hit 2 of my favorite rocky points just north of Browns Bridge and try and get a couple early morning bass for a confidence builder then hammer down south all the way to Bald Ridge The night before the tournament I meet my partner at the meeting and we went over all the particulars of the next morning. I told him we were going to be making a long cold run and to dress warm. The next morning everything went off without a hitch but when we rolled up on my first spot there was a boat on it so we moved to another point in the same area but came up empty. I pointed the boat south and ran to Bald Ridge without a fish to start the morning. I wondered if my co-angler was starting to wonder about my strategy but when you’re cranking the rocks, most times you have to be patient and give the sun time to get up and the rocks to warm up. On our first stop I zeroed but one the second stop I busted a 2 pounder to start us off. I was using the DT-14 in the crawdad pattern and I finally put one in the livewell. We went through a little lull of maybe 2 hours and I was wondering if it was going to get better. Finally I popped a 3 pounder up on the rocks and that made me feel a little better. I was just running and gunning rocks at that point. Soon I popped another 3lber off the rocks and followed it up with another 2 pounder over the course of a couple hours. Time went on and I had 4 fish in the livewell. My partner wasn’t really expecting a crankbait on the rocks bite and he didn’t have much in the way of crawfish colored crankbaits so it was slow back there for him. He did catch one on a red lipless but it just wasn’t happening for him back there. I just needed one more fish and there was less than an hour before I had to head out of the creek to the weigh-in. FINALLY, with minutes to spare I hit my 5th fish that we though was the 5 pounder that I had been looking for but it turned out to be a foul hooked 2 pounder. It was ok though because I couldn’t of ask for more in getting 5 fish to the scales in my first tournament that size. When I got to the weigh-in and started talking with other guys I realized it was a bad day for many and I was going to finish in the money!! I weighed 11.9 and finished 20th out of 142 Anglers. I was pleased. Here’s a couple pics. One more tournament to go and was feeling pretty good coming off my finish in the FLW. I didn’t fish till the day before the tournament due to weather changes but I figured the pattern would hold since we were looking at a warming trend through the tournament weekend. My partner and I checked our rock piles the day before the tournament and busted 4 nice keepers in a matter of a couple hours on the crawfish cranks and the jigs. Here’s our 4 from the day before. We felt good about the next day but as luck would have it, my luck ran out. Over night a weak front had past through and the fish pulled off the rocks and shut down for us. It was very hard for me to switch tactics when we realized it was going to be a tough day. We had basically came up empty through our first 4 stops and I started second guessing. We shifted to docks and pitching the shakey head but without pre-fishing the docks we were just fishing blind and pulled up a zero on the docks. We went back to the rocks and finally busted a decent fish cranking but it was too late and the fish just didn’t cooperate for us. Here’s a pic of our only fish from the tournament. There’s a lesson in there somewhere but I haven’t figured it out yet. It’s been a long 3 week stretch and I’m glad it’s over so I can get back to fun fishing for a few weeks. Here’s a picture of the baits that I’ve been catching my fish on for the last 3 weeks on the rocks and a few random pre-fishing pictures.